In response the Revolutionary Communist Group has been organising protests across the country. In London we co-hosted a rally at Downing street, rejecting the imperialist coup alongside Hands Off Venezuela, Anticonquista and the Marxist Student Federation. The co-hosts had written to Labour leader Jeremy Corbyn, urging him to speak out against the coup. He failed to reply and remains silent on Venezuela. 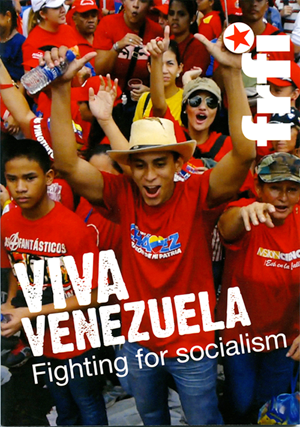 Shadow Chancellor John McDonnell issued a statement against US intervention, however it is clear his sentiments are not shared by others in the Labour Party with MP Graham Jones declaring in the House of Commons that he was ‘proud to stand with Juan Guaido, a member of Labour’s sister socialista party [Popular Will] in Venezuela’. Popular Will, a party led by violent millionaire oligarchs like Leopoldo Lopez, is clearly the kind of ‘socialist’ party Labour seeks to emulate. Meanwhile in Glasgow, the RCG coordinated a rally with the Glasgow Marxists, Hands off Venezuela, Glasgow Red Resistance, Glasgow South Scottish Socialist Party branch, Red Strathclyde and Revolution Scotland. Imperialist hands off Venezuela! No British support for the coup! Release Venezuela’s gold to the Venezuelan government now! Saturday 2 February NO COUP IN VENEZUELA! STOP THE CAMPAIGN OF LIES IN THE MEDIA!